We strive for immortality when we know it cannot be achieved. We hope for an afterlife when deep down we know there is no such thing. We exist for what is all but a flicker of an eye in the great scheme of things. Here today; gone tomorrow. 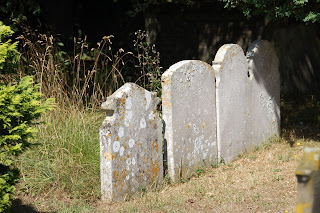 The graveyard that testament to human folly displays its stones like false teeth; false teeth for a false hope. We are alone; godless and fancy-free.